How did you contribute to OpenStreetMap ? Version 2.0 : Neis One! 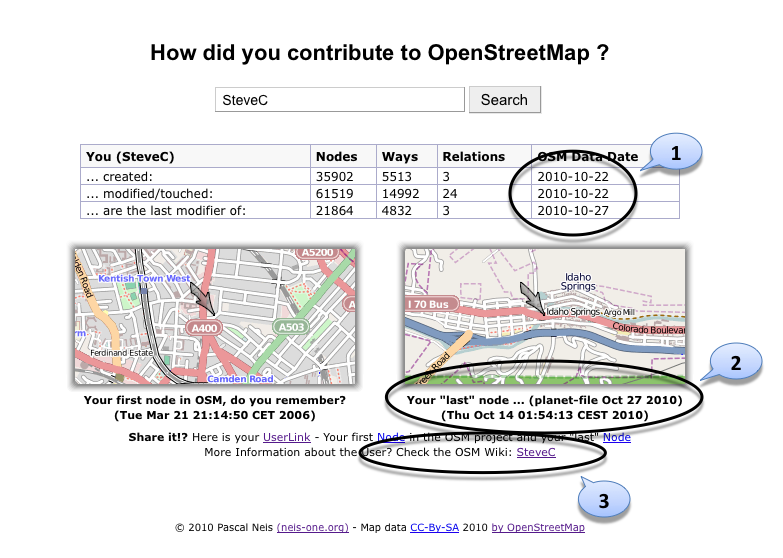 Since my last blog post there are some small improvements available for the “How did you contribute to OpenStreetMap?” website. The following picture shows the changes. First (1) I imported the new full history (10/22/2010) and normal planet dump file dated 10/27/2009. Completely *new* is the second OSM map which shows the “last” contributed node of the user (2) (depending on the imported OSM planet dump file in my database). Further a link to the contributor’s page in the OSM wiki has been included (3). So: “How did you contribute to OpenStreetMap?” Use your UserLink and share it with other OSMers or simply get some information about other OSMers!